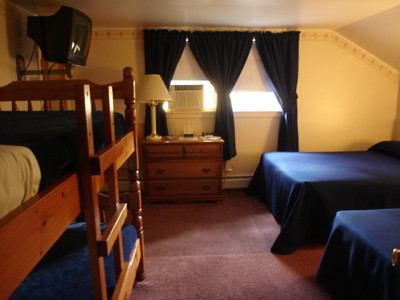 All rooms have private baths, cable television, in-room refrigerators, hair dryers, wall safes, alarm clocks, and individual thermostats. 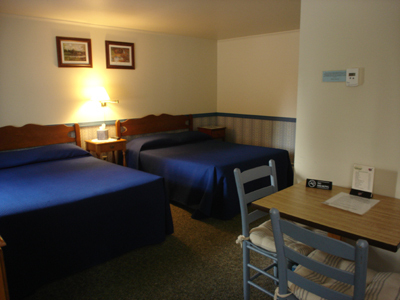 Rooms are furnished with 2 double beds, or 1 double & 1 twin bed, or our family rooms with 2 beds plus a set of bunk beds. Queen bed rooms available. Our rates include our complimentary breakfast each morning. 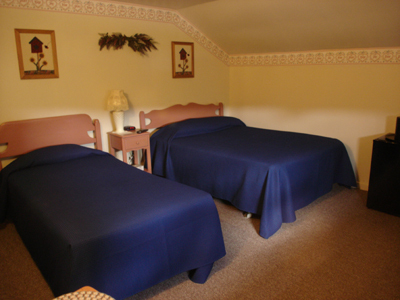 Holiday Rates - $140.00/night, double occ. 2-night min. Please inquire when making your reservation. Cancellation policy - 14 days for regular season, 21 days on holiday reservations. If you cancel ahead of the policy days, you wll be refunded your deposit. If you cancel within the policy days, if the room is re-rented, we will refund your deposit minus a $15.00 service charge. If the room is not re-rented, you are responsible for one night of the reservation. Per Vermont state law, we are a non-smoking lodge. This policy is strictly enforced - a $150.00 clean-up fee will be charged if this policy is violated. Bookings received within 48 hours of the reservation date will not receive a written confirmation. Terms and conditions on the website will apply. We are proud to be one of the first lodging facilities in Vermont to use and promote Greening the Cleaning® products. Greening the Cleaning® means eliminating to the greatest extent possible, all cleaning agents containing hazardous ingredients and replacing them with environmentally responsible, less toxic products that utilize natural or naturally-derived ingredients, and ingredients from renewable resources whenever possible. 100% of all profits from our institutional products go to the Center for supporting education and research to identify, control, and ultimately prevent exposures to environmental factors that may cause adult, and especially pediatric cancer, as well as other health problems with our children. For more information, visit www.dienviro.com or www.dienviro.com.